Let me tell you, the rental market is an... interesting game. Over the past two weeks, I somewhat drastically made the decision to end my current lease a month early, post my apartment on Craigslist, find new renters, and search for a new apartment for myself, as well. 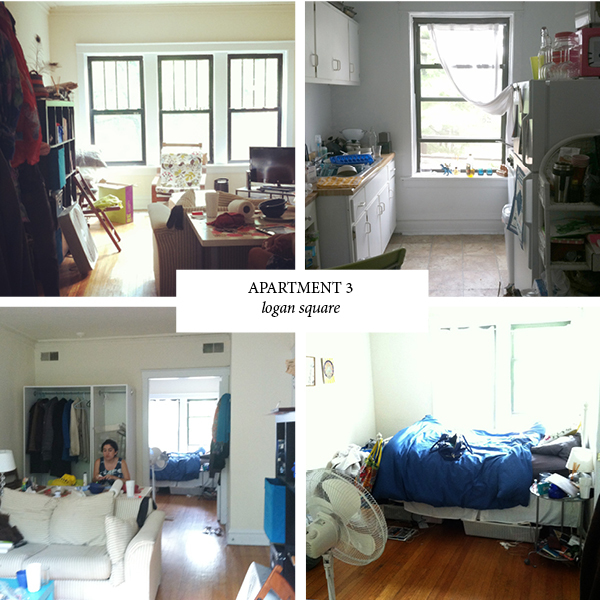 I saw at least 15 or so one-bedrooms around Chicago–and I mean all over the city, from Ravenswood to Logan Square to West Town–and am so so excited with the apartment I ended up getting, I jumped for joy when they called and told me my application was approved. - no grass outside to run the pups out when it’s lake at night, freezing, raining, etc. - it is around the corner from my current apartment and I wanted a CHANGE. - I'd have to move out in a year due to property updates and the thought of having to pack up and move again in 12 months exhausts me. - I'd have to walk down three flights of stairs outside to do laundry. That is no fun in the winter. 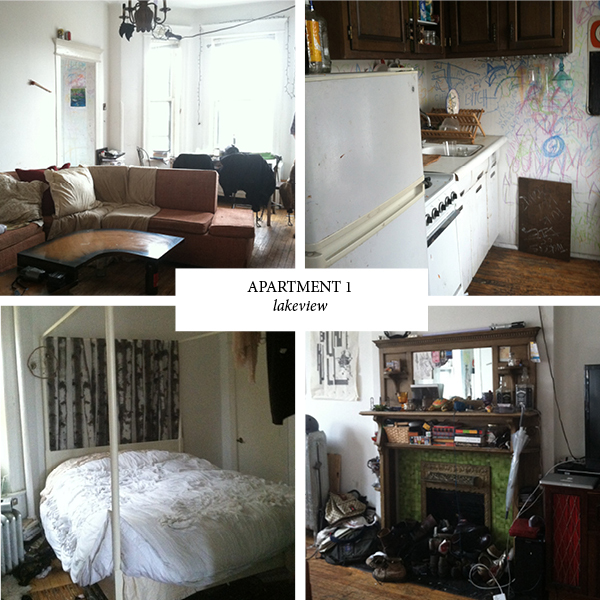 Hopefully I'll have some better before photos to show you once the apartment is vacated. This week I am in South Carolina with my family–follow along on Instagram!–so when I get back it's going to be A LOT of packing in preparation for the big move! Wish me luck! Hurray for you! I used to live in Lincoln Park...2100 North. You will love it! Yay! Are you planning on getting a portable dishwasher...or living without one? 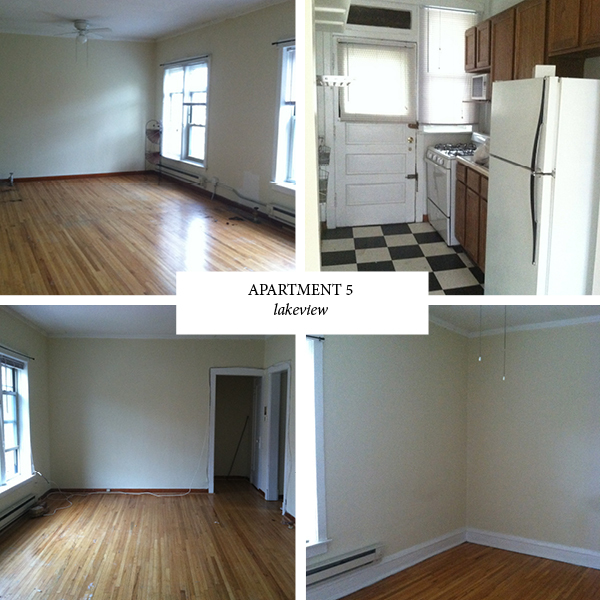 I am moving to Evanston in the next month, and I looked at apartments in May. I had the same thoughts as you — wow people are slobs. I mean, I'm somewhat messy, but not like apparently the majority of tenants! I toured one that literally made me cringe. I nearly went running. It was that bad. Can't wait to see you start decorating your new place! Wow, I had a minor anxiety attack looking at those messy apartments, but then again I am an organization freak. Congrats on the new apartment! This was such a fun post! I love looking at open houses and seeing the different layouts and design of homes. I can't wait to see what you do with your new home, I know it will be beautiful and make for some impressive before and after photos! Congrats on the new digs! I seriously can't believe how some people are living! I mean come on!? Your Runner Up is right around the corner from my place and so similar it's weird! I have to deal with the three flights down and outside to do laundry and IT STINKS so you made a good choice! My parents live in the burbs and I more often drag it all the way to their place when I visit than paying to do it at mine. BLEH! Can't wait to see what you do with your new place! i'm going to go ahead and say 99% of the world lives like slobs. it's really sad. when we looked at the place we live now, it was the grossest place. we had to scrub and sand the walls to paint, had to rip out the kitchen and replace all the floors. i bleached my whole bathroom 4 times before i used it. i like the place you picked the best. can't wait to see what you do with it. do you get to paint the kitchen cabinets? Looks like you saw some great and some really not great options, but you didn't seem to have nearly as much trouble finding a place as you could have! Can't wait to see what you do with it-your style is wonderful. Oh my. Some of those look like the duplex our daughter will be living in come fall at school. We walked in while the current tenants were still living there, and went, "huh??? you want to live here???" Her sorority sister's parents bought it and have since renovated (fresh paint, brand new carpet)...looks amazing. Good for you for seeing past the mess! Congrats on the new place! Lincoln Park is such a fun neighborhood to live in. You are right about the slobs! I looked at those pics and felt so much better about not vacuuming this morning before going to work! I am excited for you! Also, would you mind letting us know how you found most of these? I'm in the middle of a Chicago apartment search as well! We'll be neighbors! I'm Dayton and Armitage :) Puppy date. 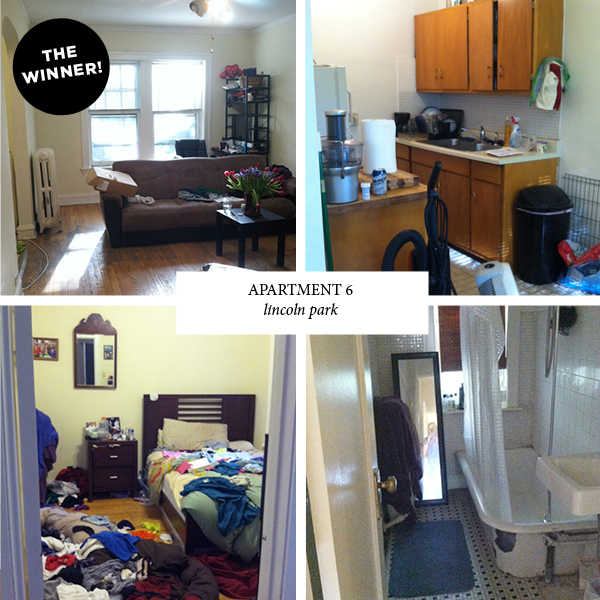 Congrats on finding your new apartment! It can definitely be a difficult thing to do, especially in Chicago. My brother used to live in Lincoln Park but just recently moved to Wrigelyville -- opposite of you! Can't wait to see how you decorate it! That is a nice home you got there! Congratulations! Glad you persevered in apartment hunting and I hope you'll have a blast decorating the place. Congrats on your new place, can't wait to see what you do with it! Oh, and I simply don't understand how people can live like that?! Glad to see you found a place that you love! 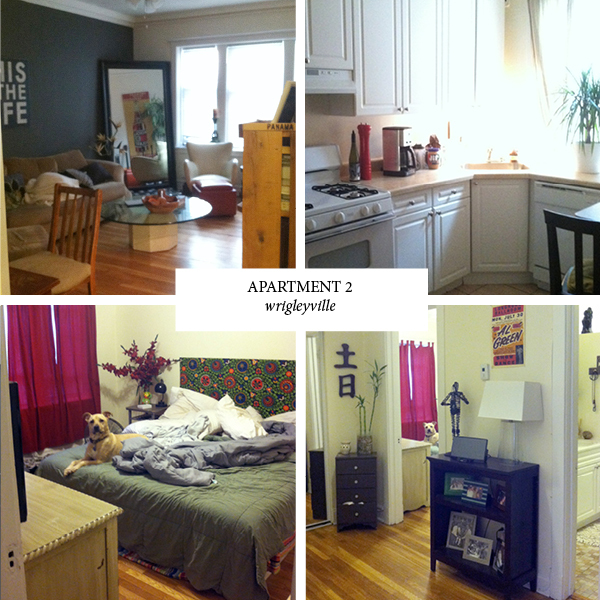 Aside from the (very logical) cons, Apartment 2 looks amazing. Have fun in SC!! Congrats! 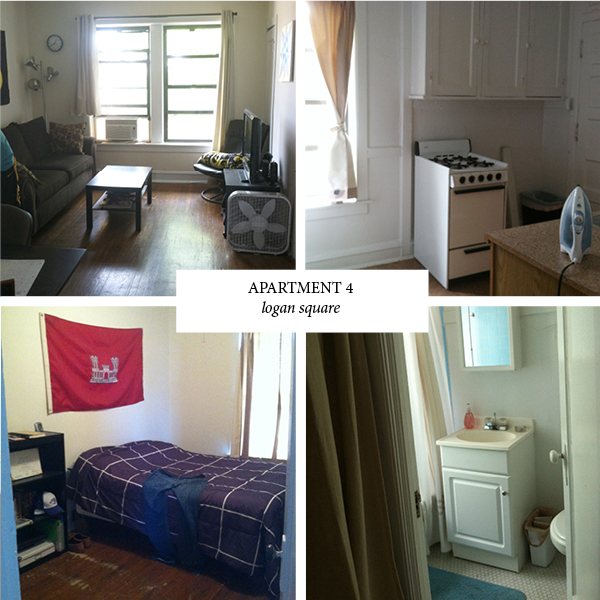 I live in Logan Square, but it's much easier to find a REALLY nice two bedroom here. There are as many one bedrooms around. Oh my! Why is everyone so messy?! If I knew that people were coming to look at my apartment I would definitely clean it up a little. Congratulations on the decision... we can't wait to see what you do with the space! It most certainly is exhausting find a new place. We'll also be neighbors-ish. I'm moving to Cambridge and Diversey in September. Can't wait to see what you do with the space! I'm going to be moving to a new apartment in the fall, and love the inspiration you've given me. I haven't had a dishwasher in my apartment for 5 years! I love to cook and it is a big time drain to wash your dishes but you get used to it I promise! So glad you have found a new lovely home! Alaina, being a Chicagoan myself (especially a homeless one as we just sold our condo and our staying with my sister), I find it so crazy what rentals are like in Chicago - especially in the fun, young neighborhoods. I look at so many places and think - no way, so I absolutely cannot wait to see what you do with this - amazing location! YAYYY!!! AMAZINNNNGGG. Im so so so excited for you!